View from the balcony of St. Patrick’s Church, at Scranton, Kan., which served its parish for more than 100 years. Update: Due to delays in construction on the new church for the parish of St. Patrick’s of Scranton, the planned Nov. 4, 2018, dedication and open house will be postponed. The new opening date or dedication plans have not been determined at this time. One year ago, in October 2017, parishioners of St. Patrick’s Catholic Church in Scranton celebrated the 100th anniversary of the current church building and 150 years of the parish being in the Scranton community. 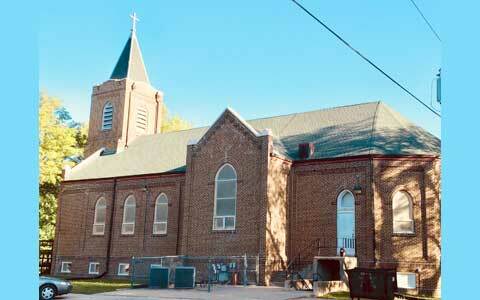 Now one year later, the parish is anxiously awaiting the completion of a new church building. If the finishing construction goes as planned, the final Sunday mass in the current church building and the new church building dedication will be soon. Parishioners plan to host a lunch after the dedication and give tours of the new church. Lunch reservations may be emailed to [email protected] or call 785-640-4503. 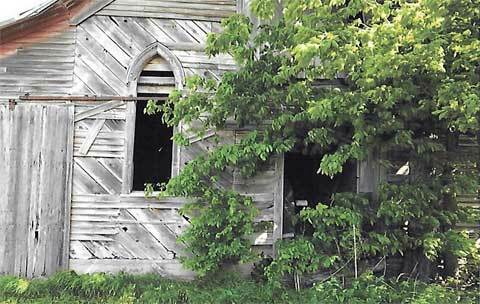 This year has been eventful and much progress has been made at Arvonia by the Arvonia Historic Preservation Society. January and February began with reflecting on memories of the Christmas tour and Christmas Tea, and planning for 2018 events. March started off strong with the St. David’s Tea in Lebo. Arvonia hosted Eluned Jones, director of the St. David’ Society of Kansas annual concert in Emporia. On the cold first weekend in April, AHPS hosted several events. On Friday, a PEO chapter from Emporia toured the buildings and held their meeting. Saturday, a group of eight came for a progressive dinner bought at a silent auction benefitting the AHPS last fall. The group progressed from appetizers at the school, soup at the church, followed by the main course at the Humphreys/Atchison house, and dessert at the town hall. All food courses contained food with a Welsh flair. The brave group walked the entire route despite the weather. On Sunday, we hosted a private group tour. The distinct white painted concrete and brick building located at the corner of Washington and Third streets in Lyndon, Kan., is known as “The Old Ice Plant”. It is most associated with Lyndon resident and businessman Roscoe Gray (1890-1981) who, with his wife Nell, operated not only an ice plant in this structure, but also a slaughter house, locker plant, and an ice cream shop. There was also a private living quarters in the building. Gray, with the help of two other men, built the concrete structure. Assisting with additions to the structure were boys from the vocational agriculture class at Lyndon High School, who wanted to earn some extra money in their free time. In a June 12, 1980, article, Gray noted that the cement was mixed by hand and hauled by wheelbarrow. He also proudly told of the popularity of their most famous ice cream flavor, “brown bread.” In this article he revealed the secret* to their recipe. Additionally, the roof garden portion was open every Saturday for roller skating parties with a big community dance held each Fourth of July. The facility was in operation from 1941 to 1959. Gray, after his “first retirement” at the age of 72, went on to lay the rock for his private residence on Ash Street in Lyndon, as well as build a dozen fireplaces for homes in the Pomona area. *Rosoe and Nell’s secret to making their brown bread ice cream: The recipe is the same as any brown bread ice cream with the following two tricks. First, soak the grape-nuts in your ice cream mixture long enough – the grape-nuts should be very soggy. Second, instead of vanilla, flavor your mixture with caramel. See more photos by Paul Schmidt below. John Switzler’s namesake creek forms a natural city limits in northeast Burlingame, as shown in the foreground on a historical illustration and satellite photo. The Santa Fe Trail crosses a small drainage known as Switzler’s Creek as the trail enters Burlingame from the east. This crossing has been in existence for traffic since the trail was created, if not in the time before history was written. The small drainage known formerly by the name “Bridge Creek” gained its name from John Switzler, a trader who was present at the birthplace of the Santa Fe Trail, and made the crossing at Switzler Creek possible. When Mexico gained its independence from Spain in 1821, the trading center of Santa Fe could finally become a target of trade with the American frontier. That same year, William Becknell led an expedition from Franklin, Missouri, to Santa Fe to gather furs, as well as find a viable route to that center of commerce. The route was already known to Native Americans as a series of trails across their plains from the Missouri River Valley to the southwest. Franklin would be the beginning of Santa Fe Trail traffic for several more years and home to notable traders like Kit Carson, and lesser known ones such as John Switzler. Switzler and his brothers took part in the Santa Fe trade. His brother Michael ran a boarding house and stable, and supplied the westbound traffic. John was not only active in the trade between Taos, New Mexico, and Franklin, but also provided mules to the traders making the journey. When traders would head out on an expedition, they would normally travel in groups, each man carrying a good rifle, dependable pistol, four pounds of gun powder, eight pounds of lead, and rations for 20 days. By 1822, Becknell had secured a route to Santa Fe that was accessible to wagon traffic, making travel easier. Starting in 1825, Becknell mapped the route and Colonel George Sibley was put in charge of an expedition to survey the route and secure safe passage for the travelers through treaties with the Native American tribes. Part of Sibley’s responsibilities required him to make the route easier to travel, and in 1826 he paid John Switzler $200, presumably to build the bridge over Bridge Creek, later known as Switzler Creek. 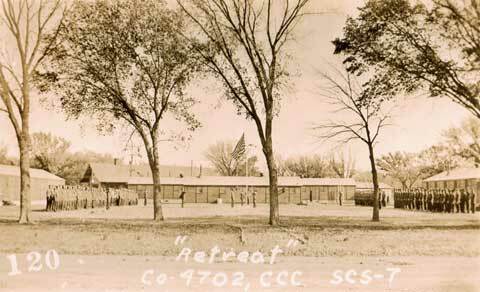 Located west of Burlingame, Kan., just off U.S. Highway 31, Havana Stage Station was a mail stop on the Santa Fe Trail. The stage station and hotel was built in 1858 and offered meals and lodging until 1869. About 50 German and French families established a community on the site. A large brewery and distillery were also located there. 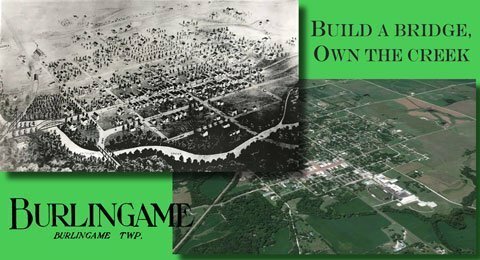 By the early 1870s, most of the German settlers moved to the town of Alma, in Wabaunsee County, and the property was sold for taxes. 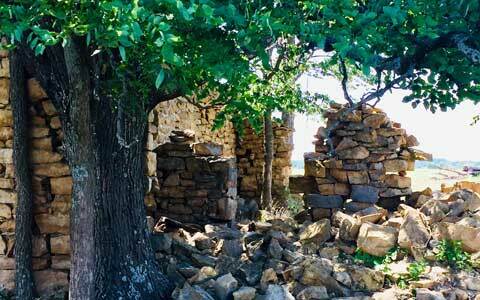 The ruins lie about 150 yards from the highway on private land, and the site is accessible only with permission from the landowner. Readers should note it is trespassing to enter private property without permission. See more of Paul Schmidt’s photos of Havana Stage Station here. This spring Lyndon High School students participated in the first Tiger Action Day. 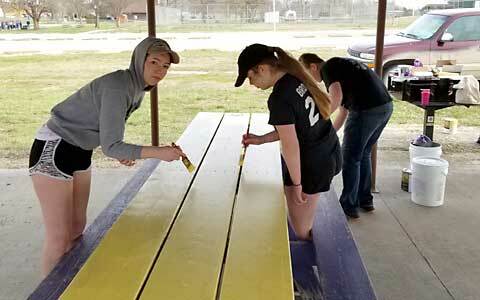 One of the activities was to help paint the Lyndon Lions Club picnic tables at Jones Park. Students shown painting are, from left, Marah Bingham, Skye Brosch, and Kolsyn Bergkamp. The picnic tables, serving counter and shelter house were constructed in the late 1990s in Jones Park by the Lions Club. The Lions extended a hearty thank you to the students for their great work. Photo thanks to Bill Patterson. 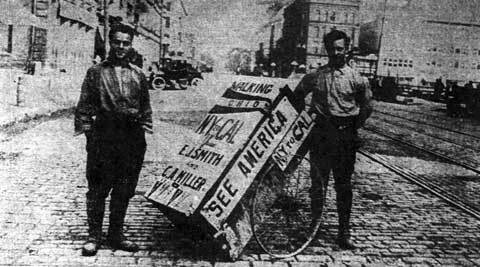 Smith and Miller were photographed with their cart, the “Fordlet”, and featured in the Hoisington Distpatch, Nov. 25, 1915. With the invention of the automobile, America needed roads, good roads – which created a push for the creation of highways, namely a highway that would cross the entire country east to west. To draw attention to this need, and following a movement created by the government to See America First, people started taking up the challenge of traveling the completed and proposed parts of this highway. Two men that took up this challenge were Edward J. Smith, age 20, and Carl A. Miller, age 19, both of New York state. 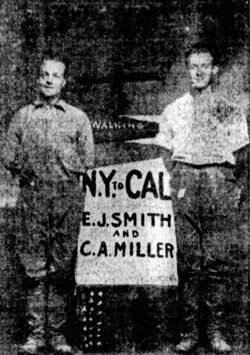 The pair left New York City in July of 1915 and headed for California with $5 in their pockets, 250 pounds of gear, and a mandolin in their cart, which they called a “Fordlet”. America was to be their school, nature their books, and the people they met along the way their teachers. Their goal was to make the trip from NYC to California in seven months. By comparison, a motorist would expect to make the journey in 30 days, which would be at a rate of 18 miles per hour and six hours per day, costing $5 per day per person. Smith and Miller as pictured in the Palladium Item, Richmond, Ind., Sept. 13, 1915. Ed and Carl made up for their lack of funds for the trip by lecturing about their travels and selling photographs of themselves along the route, all while promoting their hope for a book on their travels. They kept an extensive scrapbook, tucking away the letters of recommendation from various government officials or people they encountered, as well as mementos of sights along the way. They stayed at local YMCAs, gracious individuals’ houses, or just slept under the stars. Once the pair finally reached Kansas City, they shifted their travel from the proposed route of the Lincoln Highway to that of following the Santa Fe Trail. 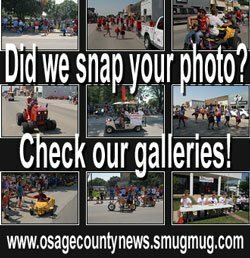 The old Santa Fe Trail closely follows modern day Highway 56 in Osage County. Some of the points that would have been seen at that time and can still be viewed today are Simmons Point Station in extreme western Douglas County, and McGee-Harris Station near Scranton. Ed and Carl arrived in northeast Kansas right after Arthur Capper had declared Good Road Days for Kansas, so he was glad to meet with them when they made a detour from their Santa Fe Trail route to visit the capital city. 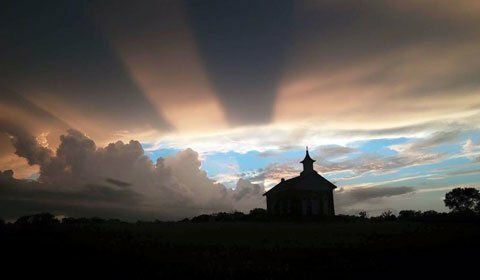 Travel back in time and come to the Arvonia Celebration Christmas Tour hosted by the Arvonia Historic Preservation Society, beginning at 10 a.m., Saturday, Dec. 2, 2017. As the traditional Welsh Christmas carol says, we are “Decking the Halls”. Restoration has been completed at the school and church. All buildings will be decorated for the Christmas season. The school has ornaments made by local students. The church has the altar rail returned and a couple of the pews restored. Christmas will be in the air at the town hall as groups and individuals perform. Chili and cinnamon rolls will be available for a donation as will warm Welsh cakes. Piano music will greet you as you enter the Humphreys/Atchison home. Funds raised from the event will go to the restoration of the town hall. Tickets are available for a minimum donation of $10 for adults and $5 for children. A family pass for two adults and up to four children is available for a minimum donation of $30. Please keep in mind that children are welcome but must be closely supervised by an adult as there are fragile items on display. 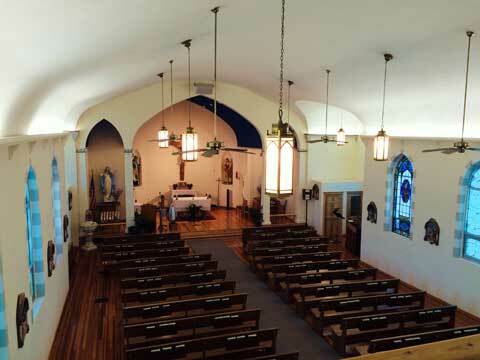 St. Patrick Church, at Scranton, Kan., has served its parish for 100 years. St. Patrick Catholic Church, at Scranton, Kan., is celebrating its 100th anniversary as a church building and 150 years as a parish in 2017. Catholicism in early Kansas goes back to the mid 1500s with the explorations of the Spanish Franciscan friar, Fr. Juan de Padilla, who accompanied the Spanish conquistador, Francisco Vasquez de Coronado. 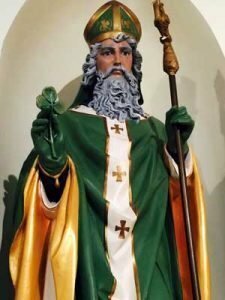 Statue of the church’s Patron Saint: St. Patrick. Catholics had settled around the Scranton area as early as 1855. The first mass was celebrated near Scranton in 1855 in a private residence. Scranton was a distant served mission until 1876 when a more permanent, regular Catholic presence was established. On Aug. 15, 1877, a lot was acquired in Scranton at the corner of Boyle and Mercer streets for the purpose of establishing a Catholic church building. A frame church was built on this location, serving about 120 people. During Scranton’s boom, there was also a parochial school serving Catholic youth from 1885 to 1889. The church’s bell was originally in the frame church building that existed until May 21, 1916, when the last mass was held in it. That bell is currently housed in the present church building. 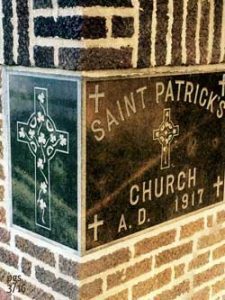 Cornerstone of St. Patrick Church, Scranton: Celtic shamrock motif indicates s strong Irish presence in the parish’s history. On June 7, 1916, the first spade was turned for the new St. Patrick Church in Scranton, to be located on the same site as the 1877 wooden structure. The cornerstone was laid in ceremony Oct. 2, 1917, officiated by then Archbishop John C. Ward of the Archdiocese of Leavenworth. The strong Irish presence in the church is exemplified by the Celtic cross design graphic in the cornerstone as well as the shamrocks within the cross on the end corner stone. St. Patrick church has had strong Irish, German and Hispanic presence over its history. 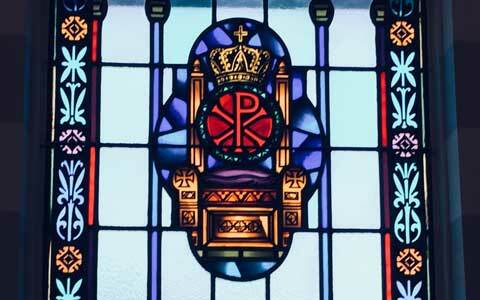 Another prominent feature of the church’s chapel are the stained glass windows donated in 1941 by the Michael Towle family. The windows are on either side of the chapel, with one showing the chiro on the throne with the crown; the one on the north side is dedicated to and features symbolism of the Blessed Virgin Mary. Stained glass windows donated by Mr. and Mrs. Michael Towle in 1941 still shine rays of light onto the congregation at St. Patrick Catholic Church, at Scranton. Michael Towle, 1859-1943, who was born in Waterford, Ireland, was a parishioner at the St. Patrick parish at Scranton. 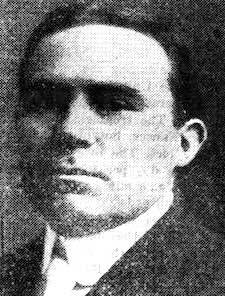 He and his wife, Mary (O’Brien) Towle, had 12 children, who all had interesting lives and occupations, including World War I veterans, teacher, author and a nurse. Three of the girls became Catholic sisters, and one of the boys, George, became a priest and ultimately a monsignor. An interesting fact about Father George was his service in the U.S. Army as a captain and chaplain at Fort Leavenworth. It was there he served as the chaplain for what was to become the last mass execution in the U.S. – seven young German prisoner of war submariners were hanged. The incident is recounted in Martial Justice (1971) by Richard Whittingham, and was also the subject of a 1997 History Channel one-hour documentary. The Towle family windows represent a significant Osage County Catholic family and an amazingly heart wrenching episode of war, religion and justice. The windows are on either side of the chapel, with one showing the chiro on the throne with the crown; the one on the north side is dedicated to and features symbolism of the Blessed Virgin Mary. To see the windows, stop St. Patrick Church is at 302 S. Boyle St., Scranton, Kan. Unique open air waiting porch projects from the southwest elevation of the depot. The unique train depot in Osage City, Kan., was constructed 1911-1912, typical of Santa Fe depots built in the Spanish Mission style during the time period. It was built by Stivers Harvey contractors, of Kansas City, for about $13,000. 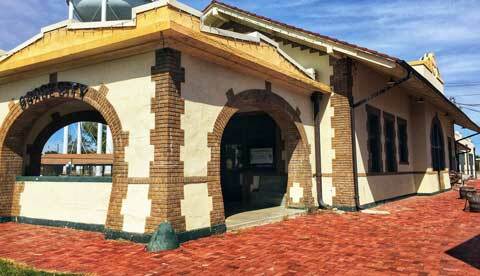 The depot is beautifully detailed in dark red brick against light creme concrete walls to recall stucco. The parapet features original Santa Fe Railroad identification complete with cross and lettering. The Osage City Santa Fe Depot is located at 508 Market St., where it was built parallel to the now Burlington Northern Santa Fe tracks that dissect the town from southwest to northeast. It is one of two such Spanish Mission style Santa Fe depots left, with the other one located in central Texas at Coleman. View of Melvern’s Pine Street Bridge from Railroad Park; staghorn sumac in foreground. The Pine Street Bridge, also known as Fifth Street Bridge, in Melvern, Kan., was constructed between May and August of 1909. It spans 148 feet and has a 15-foot wide wooden deck over a main double track line of the BNSF railroad. It may have been constructed from materials from an earlier railroad bridge dating back to 1884. The only marking is the word “Cambria” stamped on some of the beams. This indicates it was manufactured by the Cambria Steel Co. of Johnstown, Penn. The bridge was designed for vehicular traffic originally, but is now open only for pedestrian crossings. The BNSF railroad was originally chartered as The Atchison, Topeka, and Santa Fe Railroad in 1859. By the time this bridge was built over the double track, AT&SF had more than 9,000 miles of rail. 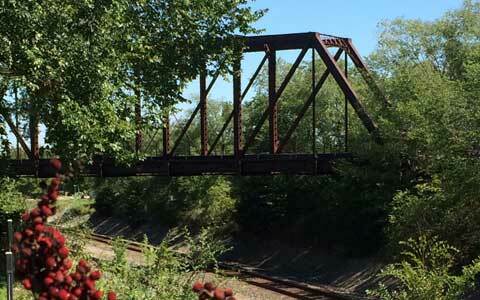 Melvern is a great town to safely view trains passing from this bridge or from a viewing stand in Railroad Park. The Pine Street Bridge is listed on the National Register of Historic Places. An old postcard depicts the Grand Opera House at Osage City; from collections of Osage County Historical Society. 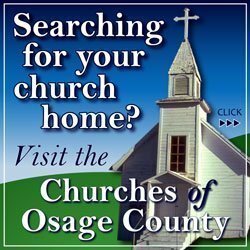 At one time, Osage City had two opera houses. The Howe House opened in 1879, changing its name to the Osage City Opera House in 1883. Its rival, the Grand Opera House, opened within five years. Each could hold around 700 attendees. These establishments brought in entertainment like prima donna sopranos, witty speakers, bands, lectures on the newest scientific discoveries like x-rays, and were the sites of community gatherings. 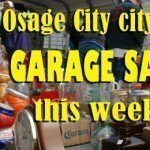 The Osage City Opera House brought in the big names, but also was a springboard for talent, not of a performer, but of a promoter – Melville “Mel” Raymond. Mel Raymond’s parents, Melville and Mary Raymond, moved their family from Eureka, Kan., to Burlingame in the mid-1880s. Mr. Raymond established himself as a grocer, supplying various fruits, baking supplies, cigars, tobacco, stationary and confections to the community. He held a high standard for his goods, and his candy stock alone had, according to the Burlingame Enterprise, “never been equaled by variety or uniqueness It is absolutely pure, he sells no other kinds.” Mrs. Raymond, on the other hand, supported the community by holding a “little folks sewing class” at her home two times per week. Mel worked as a clerk in his father’s store. The younger Melville, however, was called to a life in the entertainment business at a young age. Mel started by creating his own comedy troop with friend Fred Schenck, called the Schenck and Raymond Comedy Company. Their signature piece was called “Fun on a Steamboat” where Mel pushed the envelope by performing in blackface. The group performed the act at area opera houses, touring as far as Mel’s former home, Eureka. After that last stop, he and co-star Mary “Pet” Lamb surprised everyone back in Osage County by getting married at the Gold Dust Hotel in nearby Fredonia, Kan. However, with “the call of the amusement world loud in his ear,” he left to join Sells Brothers’ circus a few short months later, returning to Burlingame only after the group returned to winter quarters. 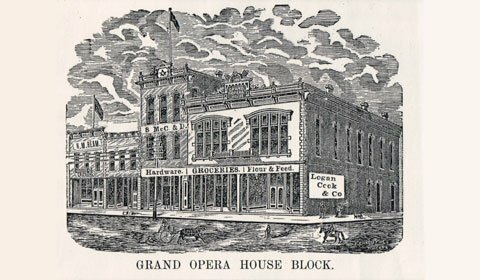 Afterwards Mel started working in opera house venues, managing the Osage City Opera House and eight others around 1891. He returned to circus life as a press and contracting agent, notably for the Ringling Brothers, but also for other minor companies. He gained the reputation for being spectacular in his methods of promotion. 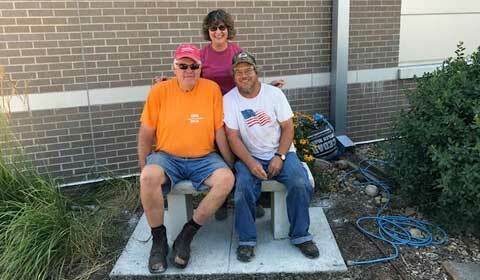 Overbrook Rotarians Don Schultz, Vic Robbins and Marian Massoth worked last weekend to install an Overbrook Rotary bench on the northwest side of the Overbrook Public Library. The Overbrook Rotary is donating three benches to the library this year, one at each entrance along with this beautiful stone bench. 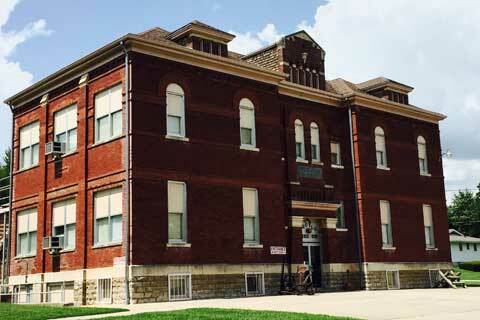 This distinct brick building built in 1902 served as Burlingame’s grade school for 99 years. Now called the Schuyler Museum, it is a repository of local, county, Santa Fe Trail, railroad, and mining history. The museum is named after Phillip Church Schuyler (1805-1872), a prominent settler, politician and reformer, who in 1855 purchased a large land claim that eventually became the town of Burlingame. The school-turned-museum is at 117 S. Dacotah St., in Burlingame. It is listed on the National Register of Historic Places. Photos thanks to Paul Schmidt. 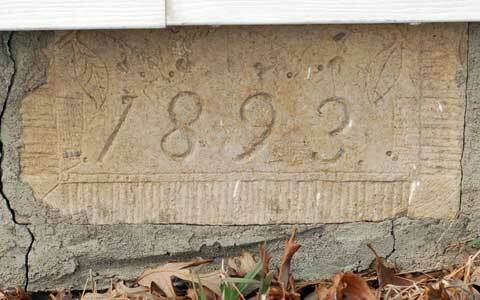 A cornerstone carved by William S. White reminds of the connection of the home’s past owners to its current inhabitants. Every home has a story. It is a standing memorial of the people that have lived and loved within its walls – each family tailoring it to meet their tastes and needs. One Osage County family is seeing to preserve the original details that were lovingly added to their century-year-old home. Michael and Sara Floyd bought their rural Osage County, Kan., home and 4.5 acres in 2014, and the home and barn were in much need of some love and attention. 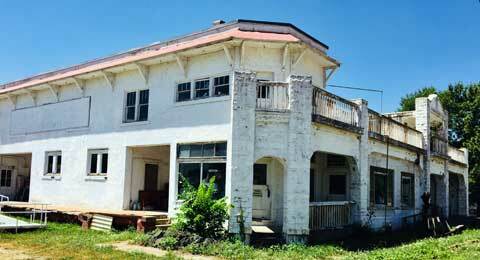 It is the Floyds’ goal to restore both structures back to their former glory. Lazing on the banks of the Marais des Cygnes River is a perfect way to spend the dog days of summer. 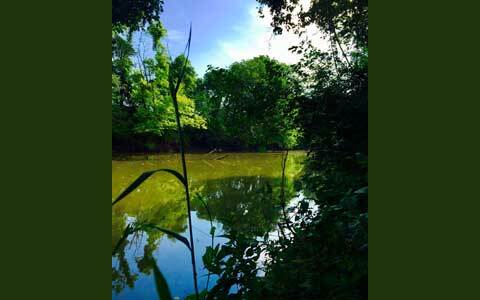 Viewed here from Melvern’s Riverfront Trail, the Marais des Cygnes River has a rich history dating back to the French trappers who named it (Marais des Cygnes translated to English is “marsh of the swan”). Melvern’s Riverfront Park and Trail includes a scenic five-mile expanse of diverse terrain that winds along river bottom and wetlands. In addition to its scenic river access, the park is an Osage County treasure of native Kansas grassland animal and plant life. Lyndon Leaders 4-H Club members and Prayer and Action team members work together to create a small “Tiger spirit” pocket park in downtown Lyndon. Courtesy photo. Despite a busy fair season, the Lyndon Leaders 4-H Club paired up with the Prayer and Action team that was visiting Osage County this summer. It has been a club goal to help beautify and give back to the community, and with the help of the Prayer and Action volunteers, the club was able to get its wall project well underway. 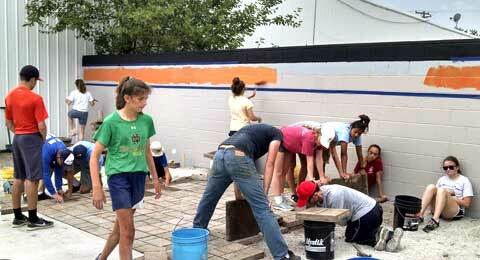 For three days they spent preparing the ground, laying pavers and painting a wall on Topeka Avenue in Lyndon. The best part about the project was being able to meet and interact with the volunteers. These volunteers were high school-aged Catholics, who devoted a week to help serve others and grow in their faith. 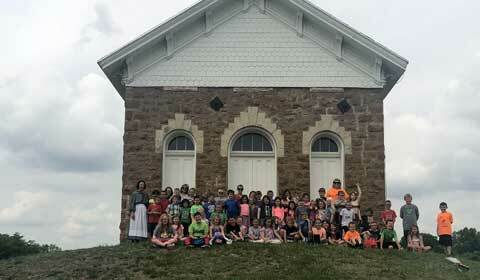 The students were from various parishes, ranging from the Kansas City area and even Chicago. After hearing of their mission, the Lyndon Leader 4-H Club reached out to them. Due to the club having so many young members, they needed the extra muscle to help with their ambitious project. 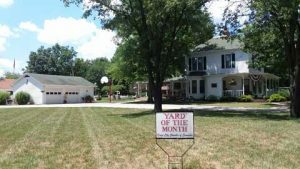 Generously, the Prayer and Action team agreed to team up with the club, and now citizens of the Lyndon community can enjoy the fruits of their labor for many years to come. There are still a few things left to do before the wall project is complete. Final plans are to put in landscaping to show Lyndon Tiger spirit.